We’re Linville Falls Winery, and we’re a family owned and operated vineyard, winery, and farm in the North Carolina Blue Ridge Mountains. 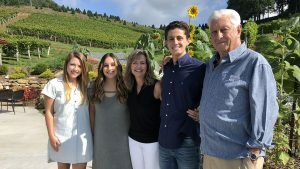 With the “old man”, Jack Wiseman, at the helm and the grandkids following close behind in his passion for cultivating grapes and winemaking, we are pioneering wine in the High Country, and truly feel like we have struck gold. Our 40 acre vineyard and farm is situated just north of the Blue Ridge Parkway and Linville Gorge in a fertile valley between hills filled with rows of lush, green vines. Our grape varieties include Seyval Blanc, Vidal Blanc, Noiret, Marquette, Petit Verdot, Marechal Foch, and our flagship grape, Riesling. 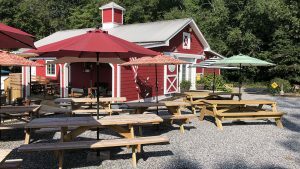 But throughout our farm you’ll also find blueberries, blackberries, raspberries, heirloom apples, pumpkins, corn, and Christmas Trees (we love growing!) At an elevation of 3,200 feet, the grapevines thrive in our mountain climate. Cool nights and low humidity allow our grapes to ripen slow while developing fresh, vibrant flavors, giving way to wonderful wines. It’s unlike anything folks have ever tasted; because it’s the first time it’s being done in our corner of the world! We are part of the newly established Appalachian High Country, one of _ American Viticulture Areas in our country, and we believe that our area will be a recognized as a fine and unique wine growing region for generations to come. We made wine privately in our home for several years. In 2011 the first grape vines were planted and now we currently have 150 beautiful healthy vines growing. In 2012 we started building a new barn and winery so that we could begin to offer the public our passion, our wine. Our tasting room opened June 14, 2014, and has been a huge success! We just added on a new addition to the winery for more seating and to have special events. The outdoor seating area was also expanded to both porch seating and patio seating. Along the way we have made some interesting wines and have worked hard to develop classic and diversely flavored wines. We have quickly become well known for our peach wine “Bodacious” which is a true southern style wine. Visit us and see what we mean by “Doing wine Southern Style”. • Wednesday and Thursday: 1pm-6pm appointment recommended but not necessary. Welcome to Medaloni Cellars, twenty-two acres of rolling hills located in the heart of North Carolina’s beautiful Yadkin Valley. 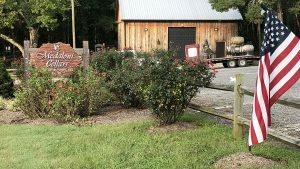 Located 10 minutes outside of Winston-Salem, Medaloni Cellars is a beautiful addition to the Yadkin Valley wine trail to be toured by wine lovers from all over.